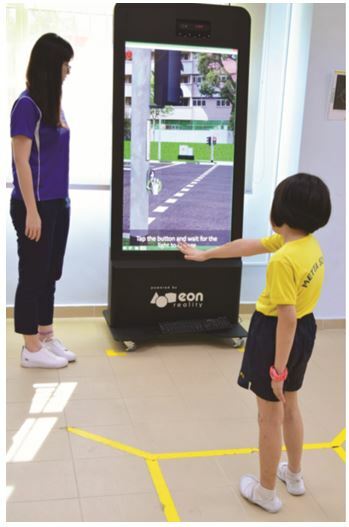 To enable our students to lead an independent life through the acquisition of daily living skills, Metta School seeks to enhance the students’ travelling skills through the use of virtual reality (VR) technology. The programme comprises of three modules- Road Safety, Taking the Bus and Taking the MRT. This programme is made possible with the funding support of Tote Board and MOE Tier 2 ICT funding. Students are presented with various scenarios which they may encounter in their daily commute. They are given opportunities to practice decision making to gain familiarity with various traffic routines in a safe environment through simulation. Staff are also able to observe and give instant feedback on students’ performance. This programme started in July 2016. Since then, it has been incorporated into the timetable of the ASD classes, and the VR technology was made easily available on a weekly basis to about 50 students with autism, aged 7 to 13, allowing them to practise their travelling skills on a regular basis. These weekly classes proved to be complementary to the school’s monthly social competence outings whereby students will get to navigate real-world conditions such as taking the MRT or crossing the road. As of 2017, the use of VR technology in travelling skills have been extended to classes in the younger age groups in the other programmes. Three basic modules in travelling skills are created to address the fundamental needs of our students with ASD. The three sub-modules found in the Basic Module for Road Safety. From the observation and feedback of the teachers, it was noticed that some of the students were able to apply and generalise what they have learnt in the VR technology as they moved around in the community during school outings. 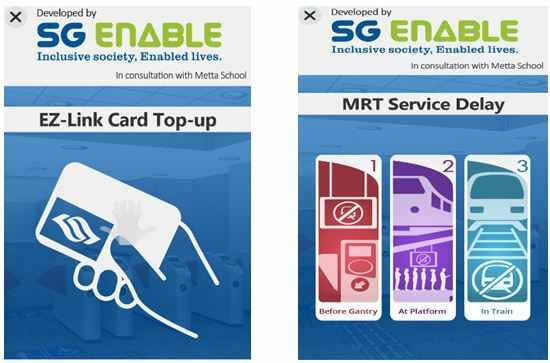 In 2017, SG Enable developed two additional modules to support the students in learning to top up EZ-Link card value and to navigate in the event the MRT Service delay. The school collaborated in giving suggestions and testing out the modules. We are grateful for SG Enable in providing the two modules free to the school. Two modules created in collaboration with SG Enable. In 2017, we also added a supermarket shopping module for students to learn about purchasing and simple money skills. In 2018, the school will develop another module to support students learning in going to clinic to seek medical treatment.